Coordonnateurs : Patel Vinood B., Preedy Victor R.
This multivolume reference work addresses the fact that the well being of humankind is predicated not only on individuals receiving adequate nutrition but also on their genetic makeup. 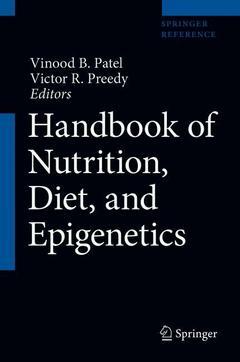 The work includes more than 100 chapters organized in the following major sections: Introduction and Overview; Epigenetics of Organs and Diseases in Relation to Diet and Nutrition; Detailed Processes in Epigenetics of Diet and Nutrition; Modulating Epigenetics with Diet and Nutrition; and Practical Techniques. While it is well known that genes may encode proteins responsible for structural and dynamic components, there is an increasing body of evidence to suggest that nutrition itself may alter the way in which genes are expressed via the process of epigenetics. This is where chemically imposed alteration in the DNA sequence occurs or where the functional expression of DNA is modulated. This may include changes in DNA methylation, non-coding RNA, chromatin, histone acetylation or methylation, and genomic imprinting. Knowledge regarding the number of dietary components that impact on epigenetic processes is increasing almost daily. Marshalling all the information on the complex relationships between diet, nutrition, and epigenetic processes is somewhat difficult due to the wide myriad of material. It is for this reason that the present work has been compiled. Nervous system.- Development and ageing.- Cancers.- Caloric and dietary restriction.- Detailed processes in epigenetics of diet and nutrition.-Modifications of DNA via methylation.- Modifications of histones.- Modifications of non-coding RNAs.- DNA repair.- Modulating epigenetics with diet and nutrition.- General treatments and strategies.- Vitamins.- Minerals.- Specific foods and nutrients.- Nutritional toxicology.- Practical techniques. Victor R. Preedy is a professor in the School of Medicine, King's College London. He directs studies regarding pathology, health, nutrition, and toxicity. Professor Preedy has published over 550 articles, which includes over 160 peer-reviewed manuscripts based on original research and 90 reviews as well as 35 books. Vinood B. Patel is a senior lecturer in clinical biochemistry at the University of Westminster and honorary fellow at King’s College London. He directs studies on metabolic pathways involved in liver disease, particularly related to mitochondrial energy regulation and cell death. Other areas include understanding behavioral and mental health problems in neurological disorders. Dr Patel is a nationally and internationally recognized alcohol researcher and was involved in several NIH funded biomedical grants related to alcoholic liver disease. Dr Patel has edited several biomedical books and has published over 150 articles.